Did Michael Cohen Prove BuzzFeed News Right About Moscow Trump Tower? President Trump’s former lawyer/fixer, Michael Cohen, is completing his heel turn on Trump today and testifying to Congress about his former boss who he said is a “con man.” His opening statement was quite extraordinary, and on the surface, it sure looks like the special counsel’s pushback on BuzzFeed News’ report (the only time the special counsel has ever released a statement) was rooted more in minor quibbles than disputing the overall narrative that BuzzFeed News stood by after being rebuked by Robert Mueller. Let’s compare the two best reports we have on the Trump Tower Moscow project. Mr. Trump did not directly tell me to lie to Congress. That’s not how he operates. In conversations we had during the campaign, at the same time I was actively negotiating in Russia for him, he would look me in the eye and tell me there’s no business in Russia and then go out and lie to the American people by saying the same thing. In his way, he was telling me to lie. And so I lied about it too—because Mr. Trump had made clear to me, through his personal statements to me that we both knew were false and through his lies to the country, that he wanted me to lie. And he made it clear to me because his personal attorneys reviewed my statement before I gave it to Congress. Short answer: yes, BuzzFeed News got it right. Long answer: it’s complicated. What Cohen is recounting now about Trump lying to him in private as a way of telling him to lie, is identical to the account McCabe gives of meeting Trump after the Comey firing. It seems likely that the special counsel pushed back on the BuzzFeed News report because the report raised the bar of criminality they were painstakingly trying to establish. If Mueller planned on putting Cohen on the stand in front of a jury, he didn’t want the jury thinking that he needed to produce an e-mail from Trump to Cohen saying “please lie to Congress.” As Cohen detailed, there was no direct order to lie to Congress. That’s what the special counsel was surely pushing back against in their statement. But there was an implicit order from Trump to lie to Congress. Cohen’s opening statement makes it clear that while he did not receive a direct order, being swarmed by Trump’s lawyers is proof that Trump had a very strong interest in what Cohen was saying to Congress. This is a wildly complex legal case, and the special counsel’s pushback to the BuzzFeed News report was not a categorical denial. It seems that the core of the dispute rests on a de jure versus a de facto interpretation of what “directed to lie to Congress” means. 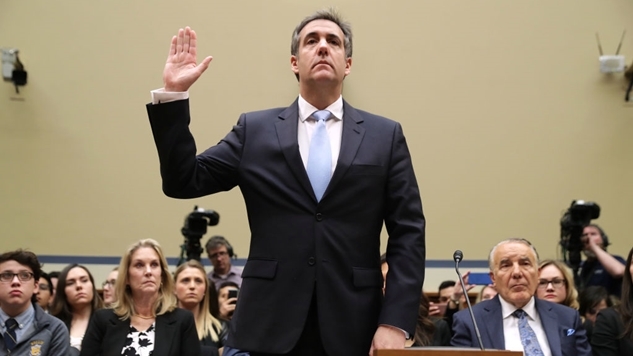 There likely is no “smoking gun” that proves Cohen right, but reading his opening statement makes it clear that the President of the United States desperately wanted to control what his lawyer said to Congress, proving that BuzzFeed News was right in a de facto sense: of course the biggest liar to ever occupy the Oval Office wanted his lawyer to lie to Congress about a topic the biggest liar ever has lied about constantly.